In true Wesson style, Johnny found a great deal for us in Krabi. We stayed at Chan Cha Lay guest house, which was only 9 pounds per room per night. It was so clean and the blue and white decor made it feel very fresh and pleasant. We arrived just after sunset and quickly settled into our rooms before heading out for a curry at one of the local restaurants. The next morning we hired motorbikes (3 pounds for the day!) and set off to explore the area, including a swim the beatufil clear water at Ao Nang beach and Maya Bay, where we had lunch. The stunning green cliffs as well as the trademark limestone rocks which protrude from the water really are amazing and so unqiue. We ended our day with sundowners on Ao Nang beach, where we (more so I) were entertained by the local gang of dogs who appear to live on (and patrol) the beach. We arrived back at Chan-Cah-Lay after dark, but not before getting horribly lost and almost running out of fuel. That evening, we headed to Fu Bar, which had a lovely atmosphere and then on to another restaurant for yet another amazing curry. 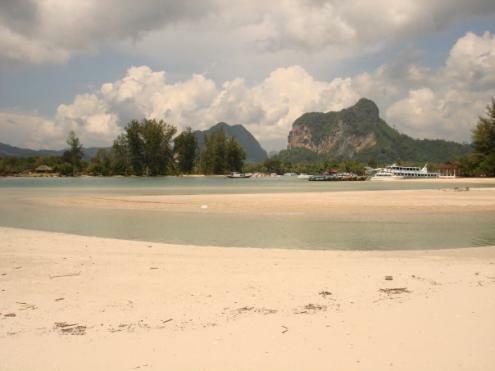 We loved our time in Krabi.